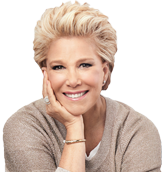 Good Morning America host for almost 20 years, Joan Lunden has appeared in numerous TV shows and movies throughout her career. 20/20, Dateline, Larry King Live, Rachael Ray, Tonight Show with Jay Leno, David Letterman, Prime Time Live, 60 Minutes, Today Show, Oprah, Rosie O'Donnell, The View, The Bonnie Hunt Show, Live with Regis and Kathie Lee, FOX News in the Morning, The Wendy Williams Show, The Joy Behar Show, Tony Danza Show, Ellen, FOX Good Day Live, Entertainment Tonight, Access Hollywood, E! Entertainment News, Inside Edition, Extra!, The Insider, On Air with Ryan Seacrest, FOX & Friends, Hannity & Colmes, Conan O'Brien, Charlie Rose, Phil Donahue Show, FOX Business Channel Happy Hour, Sally Jessy Raphael, Ricki Lake, Jenny Jones, The Home Show, The Tom Snyder Show, Carol & Marilyn, Mike & Maty, The Maureen O'Boyle show.